A couple of weekends ago, we had a special surprise birthday celebration, for a special birthday boy, who has just turned 40. No, it wasn’t me, it was for my brother-in-law. My special 40th surprise comes next year… *cough*. The venue in question was a lovely gastropub, just off the coast in Suffolk, near Southwold. And because there was a large group of us, the pub needed us to all pre-order a week before our arrival. Which is fair enough. Although you do have to pity the poor person in question who is organising it all and must repeatedly coral everyone into getting their requests in; via texts, emails and threatening phone calls. Especially on the morning of the actual day that you are supposed to be all gathering to eat. In this case, it was my sister and bless her for keeping her cool. Of course, when it comes to ‘pre-ordering’ someone will ALWAYS forget what they chosen. Or change their minds on arrival. Well, on this occasion, there was a veritable toppling of dominoes, punctuated by a heavy sigh that sort of said ‘I don’t know why I bother.’ But it really wasn’t my our fault. In fact, the pub is to blame more than anything else. If their waiting staff hadn’t been carousing around the place, waltzing through swing doors with these fantastic plates, loaded with fragrant steak and golden chips and going to other tables; then the temptation would never have been there. And I wouldn’t have changed my order at the very last nanosecond. Yes, for me personally, steak and chips is often the great un-doer and unraveller of things. Particularly in pubs and restaurants. Even when I do have the time to peruse a menu, a handsome hunk of meat usually comes out on top. Largely because any chef worth their seasoning salt, will know what they are doing with steak and if you head into places like Hawksmoor or Goodman, well half the battle is over. You can breathe easy, safe in the knowledge that you are in for a treat. Unless they’ve carted in a chef from Aberdeen Steakhouse last minute that is. I suspect that this sort of thing never happens though. And don’t get me wrong. I like to think I can crack out a decent ribeye with a pan or chargrill, all crusted evenly and with a nice amount of blush to show when you cut through. Time, care and attention is all you really need. However, whenever I invest in a prime cut, something that has cost just that little bit extra, a certain degree of nerves can set in. 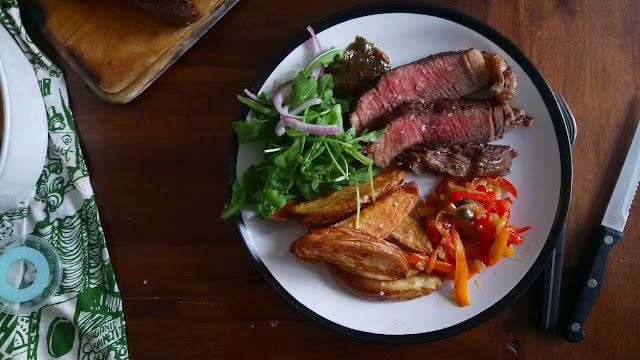 These nerves sort of came to the surface when I recently tried out a bone-in ribeye from Sainsbury’s new selection of steaks, that have been added to their Taste The Difference range. 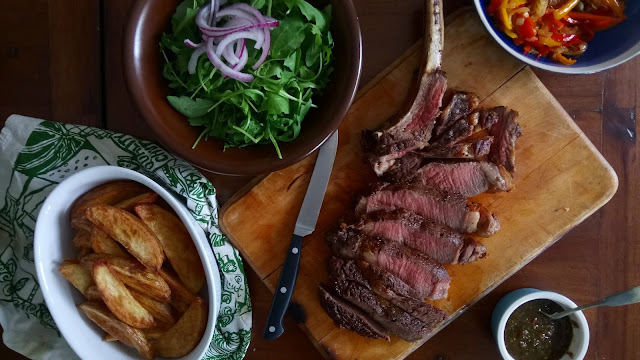 Along with an addition of Bone in Sirloin, Picanha and Flat Iron cuts, Sainsbury's have certainly upped the ante on the premium front, delivering British steaks that have been aged for 30 days, on top of their regular range of 21 old day steaks. 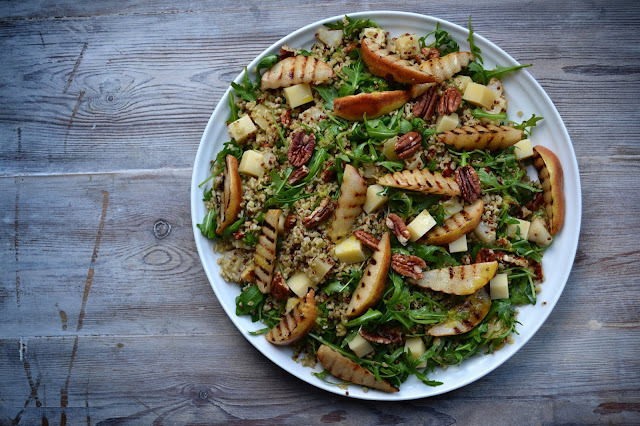 Which is great for the customer, as this does finally begin to bridge the gap between restaurant offerings and home-cooking. Particularly for the general public. Tasteless rump or sirloin has been a bane for many supermarkets, so it is good that a store like Sainsbury's is pulling its socks up and meeting the big boys head on. But this does also bring us around full circle. 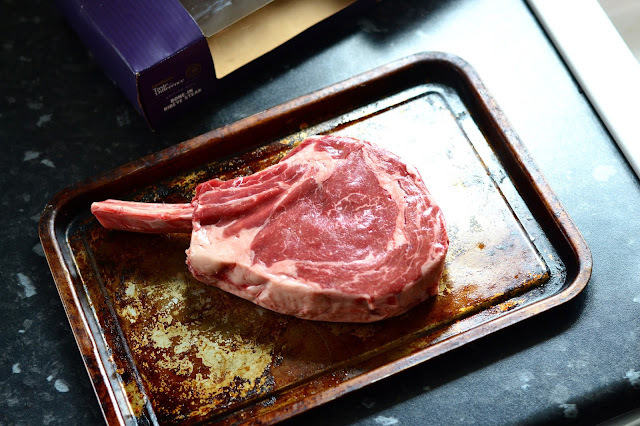 Insofar, that if you decide to buy in something special, for say an anniversary, to share, what should you be doing to make sure you get the best out of your huge and ginormous bone-in ribeye steak? Well to begin, the golden rule is start by bringing your steak up to room temperature. Never grab a steak straight from the fridge and whack it on the stove. That pretty much is sacrilege. So, take it out at least an hour before you are ready to cook. Seasoning is the next point and when it comes to adding flavour, all you are ever going to need is sea salt and cracked black pepper. Herb butters and robust sauces are a fine thing but if you are going to be cooking a steak that has been aged for 30 days, you can be sure that everything is going to tip top on the taste bud front. Although if you must, béarnaise is a good shout. Once you’ve seasoned the steak generously, it is then time to get the oven on, up to 200°C and to get that pan hot. Smoking hot. And using a frying medium such as a spritz of sunflower oil (or beef dripping even!) isn’t such a bad thing. 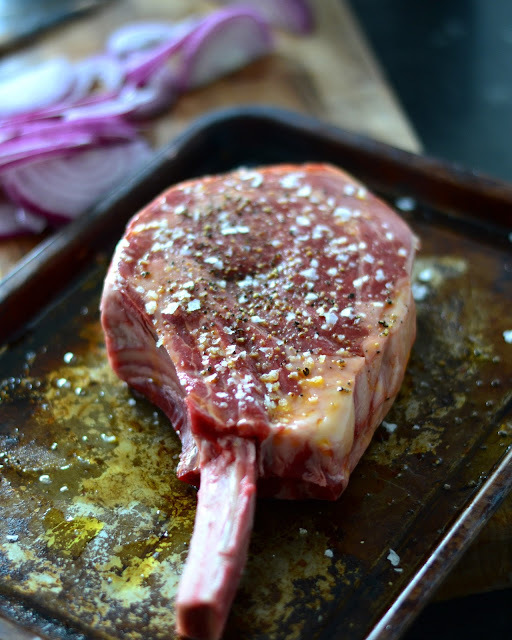 But if you are cooking a bone-in ribeye, the fat content will do most of the work. Slap the ribeye in and wait for 30 seconds before turning and wait for another 30 seconds. Drop the heat a touch and then keep turning the steak for another couple of minutes. Contrary to popular belief, it doesn’t pay to simply leave the meat in the pan to sear. You need to keep turning, to develop that magic crust. 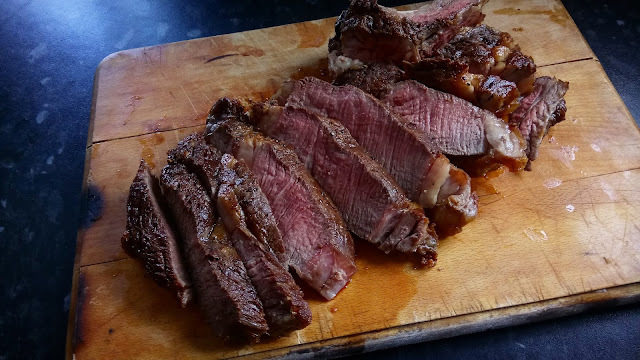 Because the Sainsbury’s bone-in ribeye is a fairly large beast, you can finish off in the oven and rely to a certain degree on timings, depending on weights, to cook your steak to the required rare, medium-rare, medium or (dare I utter the word) well-done. After a degree of guess work, the instructions on the box will take care of that but if you have a meat thermometer, to keep an eye on things, then that really will pave the way to cooking the steak, just the way you like it. 55°C to 59°C for medium-rare or 60°C to 65°C for medium are the temperature you should aim for. Go over that and I am not sure we can be friends. Finally, and perhaps the most important part, is to let the steak rest after cooking. Taste buds may well be on fire by this point, with saliva glands unable to douse the flames but so much good work can be undone by tucking into a steak too soon. So, do yourself a favour and leave it alone, for at least 10 minutes. But this is the treatment I gave my bone-in ribeye and I was pleasantly pleased, if not surprised by the end result. Because this cut usually has nice amount of fat that renders out, you can sort of guarantee tenderness, yet this ribeye seemed to be even more succulent than most. Which I attribute to the bone itself. Meat always cooks best on the bone. Plus, it had that inherent blue cheese flavour, that begins to come through after decent maturation, that glorious, umami hint of Stilton on the tongue. Did it stand up to restaurant steak though? Well of course it did. I cooked it didn’t I! And if I ever saw it come rumbling out of a professional kitchen door, I would certainly favour it over any beef burger that may or may not been previously ordered.